Mistletoe is a hemiparasitic plant in the Family Santalaceae. 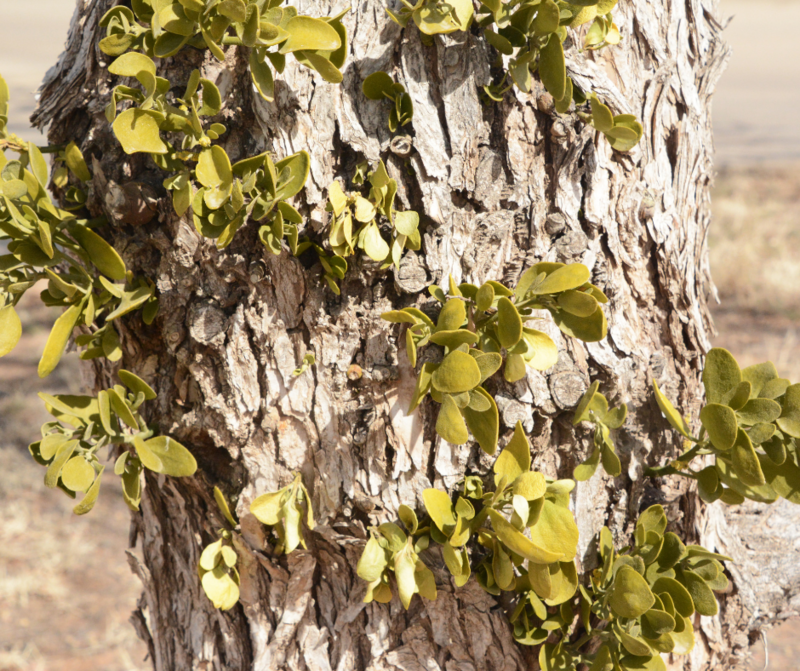 Phorodendron is a common genus of mistletoe native to warmer temperate and tropical regions of the Americas. The shrub-like Phorodendron grows on the stems of trees. Even though it possesses chlorophyll and undergoes photosynthesis, Phorodendron still relies on a host as a source of water, minerals, and some nutrients which are extracted through root-like structures called haustoria. The flowers of Phorodendron are yellowish-green, unisexual, and inconspicuous. The fruit is usually white and berry-like, although it is actually a single-seeded drupe imbedded in sticky juice. Phorodendron seeds are usually dispersed by birds when they eat the fruit and pass the seeds through their digestive tract. In North America, the birds most commonly associated with the spread of mistletoe are cedar waxwings, phainopeplas, bluebirds, and other thrushes. Unless a tree is heavily infested, mistletoe seldom kills its host, but infestation can cause a considerable amount of stress making the host more vulnerable to other disease-causing agents. Some species of Phorodendron grow on a wide variety of host tree species like hackberry, mesquite, juniper, elm, and Osage-orange, but other Phorodendron species are host specific. Mistletoe is often regarded as a pest species which devalues natural habitat, but some mistletoes act as ecological keystone species by having a pervasive influence over an entire community. So with a little basic biology of mistletoe being said, how did it become a long held Christmas custom for a couple who met under a sprig of mistletoe to share a kiss? As with most traditions, the origins are a little convoluted and murky. 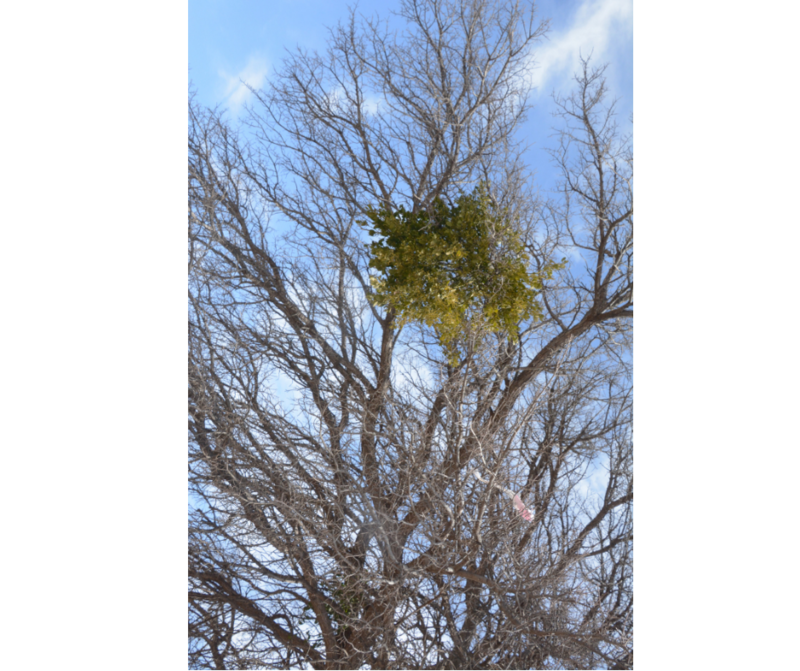 The symbolic history of mistletoe actually dates back thousands of years. Many ancient cultures valued mistletoe for its perceived healing properties. The Ancient Greeks used mistletoe as a cure for almost anything. The Roman naturalist Pliny the Elder (A.D. 23-79) noted that mistletoe could be used as a balm against epilepsy, ulcers, and as an antidote for various poisons. Mistletoe folklore also borrows from Norse mythology. One narrative goes that the god Odin’s son, Baldur, was prophesied to die, but Baldur’s mother Frigg (the goddess of love) went to all the plants and animals in nature to secure an oath that they would do no harm to her son. Unfortunately, Frigg failed to consult with mistletoe. Another god, the shrewd shape-shifting Loki, made an arrow from mistletoe and saw that it was used to kill Baldur. According to one version of the myth, the other Norse gods were able to resurrect Baldur, after which Frigg proclaimed mistletoe to be a symbol of love and vowed to plant a kiss on all who passed beneath it. The romantic overtones associated with mistletoe, however, probably originated with the Celtic druids of Gaul, Britain, and Ireland in the 1st century A.D. Because mistletoe is green even during winter’s cold, the druids saw it as a sacred symbol of life with mystical powers to bring good luck to a household and to ward off evil spirits. Mistletoe was often administered to humans and animals in the hope of increasing fertility. When the Celts were eventually converted to Christianity, they did not completely abandon all their traditions, including their reverence for mistletoe. When Christianity became widespread in Europe after the 3rd century A.D., the religious or mystical respect for mistletoe was also integrated. The association of mistletoe with life and fertility continued through the Medieval period of Europe between the 5th and 15th centuries when many Christmas traditions had their origin. bush. When the berries are all plucked the privilege ceases. Human traditions are passed within a group or society, often with symbolic meanings and special significance, sometimes over thousands of years, but sometimes over just a few generations. The roots of many traditions around the world often have their origins tied to observations from the natural world.